Investors, innovators and inspirers of the restaurant and hospitality world met at the Global Restaurant Investment Forum (GRIF) in Riyadh. The forum aims to create a platform where professionals in the hospitality industry can meet and share ideas. Riyadh has the potential to evolve into a global hospitality hub, which is why it is a good fit for the GRIF conference. Saudi Arabia is expected to see 13.5% compound annual growth rate by 2022 in the hospitality sector. This is in line with the country’s target of welcoming 30 million visitors annually by 2030. GRIF is also acclaimed for presenting global trends in the industry, by introducing disruptive and innovative technologies to transform the way business is done in the hospitality sector. Ignacio Ramirez, Winnow’s Managing Director in MENA, spoke about the pressing problem of food waste and the best ways to run a more profitable kitchen. 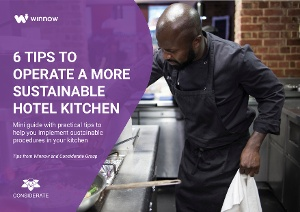 Through our extensive research, we debunked the myth that most of the food waste in the hospitality sector comes from the customer’s plate by analysing over 450 kitchens. We found that more than 70% of food wasted occurs before it gets to the customer. Over 60% of total food waste by weight is thrown away because of overproduction, and is responsible for over 80% of the cost of the waste. Tracking food waste is the first step to reducing it. Winnow is already working with the Ritz-Carlton Riyadh and Kempinski Al Othman Al Khobar. Winnow works extremely effectively in the UAE, and serves 30 clients across the region - AccorHotels, Rotana, EMAAR and Majid Al Futtaim to name a few. On average, a kitchen adopting the Winnow system can expect an ROI of 2x to 10x in the first year. Saudi Arabia can expect a massive reduction in food waste in the hospitality industry if they focus on measuring and managing it. Prince Alwaleed Bin Nassir – President, Saudi Arabia Restaurants Association spoke about the reforms undertaken by the government to stimulate growth in the sector and strategies to ensure long-term success in Saudi Arabia. An industry update on global developments like the importance of data in forecasting F&B trends was an interesting listen. Verifiable and trustworthy data is one of the main value additions that installing food waste technology provide. It is essential as F&B professionals get the chance of forecasting trends accurately into the next day/month/year. Saudi Arabia is undergoing reforms as a part of Vision 2030 - a governmental plan to diversify the country’s industries and transform the economy into a less oil-dependent one. The first tourism visas were issued to visitors in 2018 and for the first time, women can be issued a tourist visa without a male chaperone. These changes are set to drive growth in the hotel and tourism sectors. Food waste presents an important challenge to the hotel sector in Saudi Arabia, but there is enormous savings potential for hospitality in addressing the issue. We would encourage all Saudi operators to see food waste as an opportunity to significantly cut costs while also contributing towards the country’s sustainability journey.